Hello everyone and Happy Valentines Day! I hope you are having a lovely start to your week regardless of whether or not you’ve chosen to celebrate cupids holiday, and just so you know you are quite loved for visiting my blog today and every other day. As you can see today’s recipe is for Brownies, and although the ingredients are run of the mill I assure you the resultant treats are anything but. I came across this recipe in the latest issue of Bon Appetite magazine and in fact it is hard to miss in that issue as it’s the cover recipe. Bon Appetite is great because it’s recipes run the gamut from esoteric to effortless and are nearly always delightful. This recipe is more on the effortless side and I’m still having trouble reconciling the chasm between the paltry effort that I was required to put forth and the ambrosial results that I achieved. 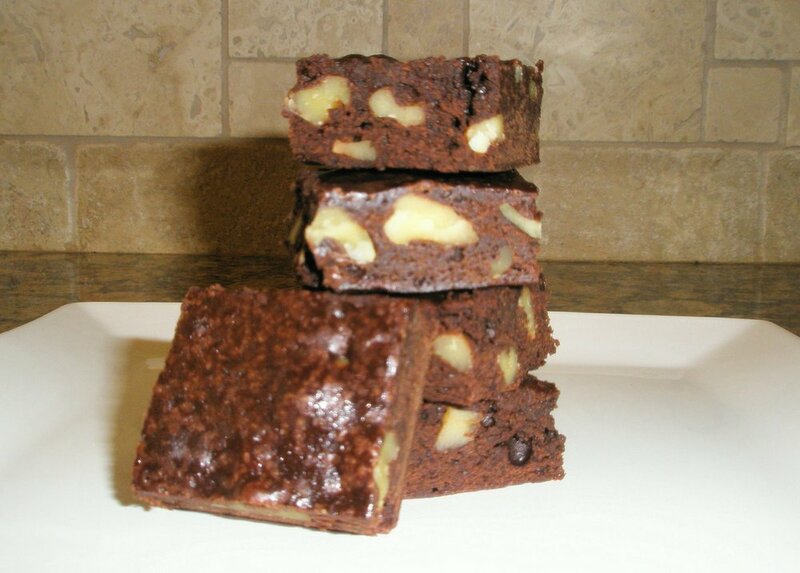 These treats are intensely chocolatey and have a texture more closely resembling fudge than brownies. The most amazing aspect of these though is that all their chocolatey goodness is derived not from fine quality chocolate but that bitter brown powder in your kitchen cupboard known as cocoa powder. Amazing, I know. The only other special thing about this recipe is that it entails the use of browned butter which is EXACTLY what it sounds like butter cooked to the point of turning brown. As silly as this sounds the extra step adds a delightful depth of flavor to the brownies that is difficult to pinpoint but delicious to taste. A few final notes before you pull out your mixing bowls. These brownies cut really well i.e. they don’t crumble too much; just make sure they have cooled completely. Although I stuck with basic squares they can be cut into any number of shapes; for example Hearts: ) Also, as per usual I swapped out some of the butter in the recipe for plain unsweetened yogurt; specifically I used 7 Tablespoons of butter and 3 tablespoons of yogurt instead of using all butter. I would have probably knocked that down to 5-6 tablespoons of butter but I had already used some of the butter stick and I didn’t want to leave 1 lonely tablespoon in the fridge. Besides that I left the recipe as is. Melt butter in medium saucepan over medium heat. Continue cooking until butter stops foaming and browned bits form at bottom of pan, stirring often, about 5 minutes. Remove from heat; immediately add sugar, cocoa, 2 teaspoons water, vanilla, and 1/4 teaspoon (generous) salt. Stir to blend. Let cool 5 minutes (mixture will still be hot). Add eggs to hot mixture 1 at a time, beating vigorously to blend after each addition. When mixture looks thick and shiny, add flour and stir until blended. Beat vigorously 60 strokes. Stir in nuts. Transfer batter to prepared pan.